Impingement syndrome is condition commonly seen in aging adults. 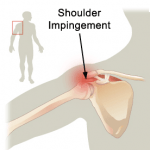 Impingement involves the contact or rubbing of two bony structures. Over time, this can create bone spurring and degenerative changes of the joint. As a result the shoulder may weaken or the soft tissues may be compromised. Impingement is closely related to rotator cuff tendinitis and shoulder bursitis. As a result of an injury to the rotator cuff muscles swelling often ensues, triggering a series of events that lead to pain and weakness in the shoulder muscles. Treatment for shoulder impingement includes oral anti-inflammatories, ice and rest. Physical therapy may be assigned by your physician to improve flexibility within the joint and strengthen the surrounding muscles. When a patient fails to improve with conservative measures, surgical intervention is and option to address their impingement and possible further intra-articular damage it has caused. The impinging portion of the shoulder can be removed to provide smooth movement of the joint and to avoid future damage to intra-articular structures, such as the labrum. Shoulder arthroscopy is generally an outpatient procedure. The averagepostoperative course involves 2-6 weeks in a shoulder sling to protect the work done on the shoulder. 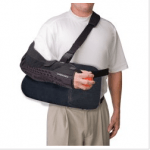 A sling may be required for 6 weeks if the shoulder's condition requires a more extensive surgery. Most patients begin physical therapy 2-6 weeks after surgery. Patient's return to work is extremely variable after their procedure, depending on their surgery and their work type. Athletes can expect to return to sports between 6 months and 1 year after surgery. High-level athletes participate in an intense physical therapy course after surgery, gradually increasing their workout intensity.